Six years has passed since the bloodbath known as the Dragon’s Head Rush conflict. Over 500 people with supernatural powers have been found dead -- presumably by suicide. 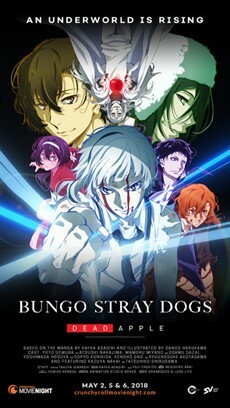 The Armed Detective Agency is tasked with the mission to capture Shibusawa Tatsuhiko, the mysterious special ability user thought to be involved. But when Osamu Dazai disappears, the "Demon" Fyodor begins showing his shadow. Those with supernatural powers, known as Special ability users, are threatened by an onslaught of unprecedentedly powerful enemies, and the city of Yokohama begins falling into a terrifying nightmare. Atsushi and Kyouka infiltrate Shibusawa’s fortress, where they are met by Akutagawa, who delivers an unthinkable truth.